In our About Us page, one of the things we said about why we created this blog apart from igniting the rebellious side of traditional Pinay brides is the fact that we are huge fans of the Philippine wedding industry. So when we got invited to the book launch of The Power 7 (thanks to our ever awesome friends Madge Landrito and Jason Magbanua), Mica and I were excited to say the least. As we trooped to Fully Booked High Street’s rooftop, we didn’t know what to expect, except for the fact that Thunderbird Resorts was the brainchild in conceptualizing the Power 7 book and that it paid tribute to 7 of the most powerful innovators of the wedding scene. As Mica went up to the registration table, and scanned the book, for some reason she had an inkling that our Bora wedding will be in it—and true enough, Jason himself, handpicked it as one of his top 3 favorite weddings! BEYOND WORDS!!! My husband was so excited by this that he kept on asking me to have the book signed by Jason! And when I told him to just approach him, he was being all shy about it haha! I literally had to speed-read this book just so we can give it a proper blog feature as soon as possible! What have I personally learned from this book? First of all, we are lucky to have already worked with 2 out of the Power 7 (that’s Jason and K by Kaye Cunanan). The other 5, after reading through their stories, their work ethic, and their body of work, are making me dream of someday working with them. Specifically, my usual “topak” brain is making me visualize a trash the dress shoot with Dino Lara and Oly Ruiz considering I already have 5 wedding gowns to-date. Hahahah! And of course I would absolutely LOVE to have a rebellious photo shoot with them for the blog! Second of all, this book, which is obviously a great marketing and branding tool for Thunderbird, is an eye-popper for great brands/clients who are willing to push the envelope, support an industry, and take a risk. *A little commentary here: we get a lot of emails from Rebellious Brides readers asking us to recommend wedding planners. 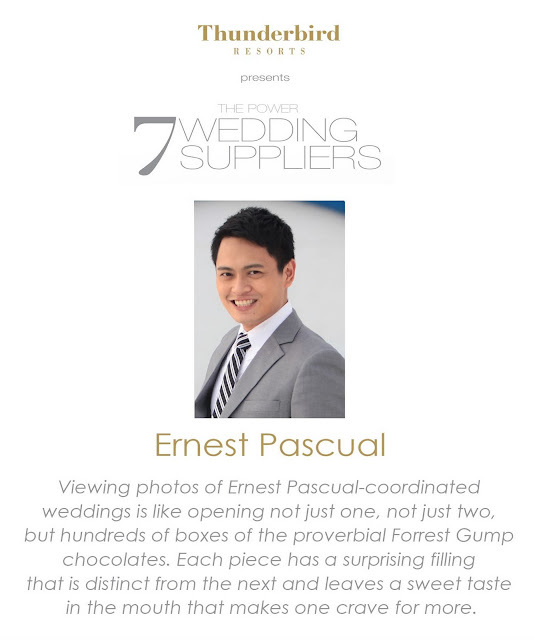 And unanimously, when I ask the most influential people in the industry on who they would personally recommend for a creative wedding, hands down they recommend Ernest Pascual. Also, I have not personally had the honor to work with him just yet, but through K by Cunanan, he somehow had a “hand” in our June wedding as well. And it was absolutely beautiful! *A little commentary here: learned A LOT about Dino in this book. Some of the most interesting things I learned about him apart from being the one to pioneer the digitized albums, the photojournalist wedding style, and being awarded as the best photog in the world was that of how he played as one of his bride’s confidante and source of strength during the Manila Peninsula Hostage taking. Now THAT’S what I call genuine commitment and relationship between a client and a wedding partner. *A little commentary here: I first learned of MetroPhoto when one of our closest couple friends got them for their wedding. When I saw the slideshow, I was so in AWE of their photos that for a split second I wished I booked them for our own wedding haha. But of course we were happy with our photog—but nevertheless, I truly wish to be able to work with Oly someday too. Learned a lot about Oly in this book too such as how one of his goals was to create a distinct style for MetroPhoto so much so that when you put it side by side a different photo, you would know which one is theres—and they have definitely done just that! *A little commentary here: Well first of all, we have a long, overdue write-up on K since we actually put her in our Rebellious Bunch list. Haha! Each time someone asks me to personally recommend a caterer, I always have high praises for Kaye, even when I haven’t had the chance to personally work with her yet. And when we DID get her for the June wedding, she was definitely one of the best parts of that wedding. We never met her personally though, because it was my parents who planned the wedding—but I was adamant on getting her, and she was also adamant in emailing me directly too (despite my lack of involvement in the wedding). And just through emails and pegs, she nailed how I exactly wanted our table setting to look like. I am just simply…a fan! 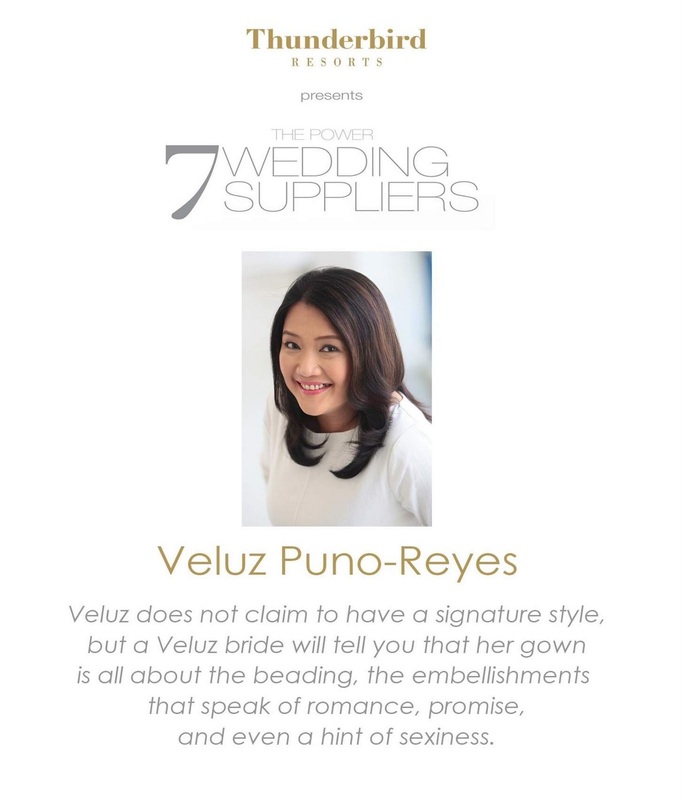 *A little commentary here: I have a friend who literally cried and felt like her dream wedding crashed down when she learned that Veluz was no longer available to create her gown. And as I read her story from this book, all the more was I inspired by her story. In this designer conscious-infested country, in which for so many eras it was monopolized by an elite few, I truly admire how Veluz was able to make a name for herself. *A little commentary here: Each time I would look at magazines and blogs and be in awe of a wedding’s styling or flowers, chances are, when I look at the credits it would have Teddy Manuel on it. What I truly admire is his range—he can definitely do the opulent, the classic, and the sophisticated, no doubt about that. But he can also surprise and delight with whimsy, quirky, and refreshing ideas. What I have also noticed is that traditional brides have learned to let go and be a little bit more dramatic and secretly rebellious just by getting Teddy Manuel, and for that I totally admire him! Can you guys even believe that a beautiful place such as this exists in La Union? Right in our very own backyard? 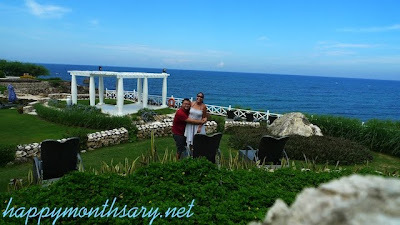 Guilty as charged, Cy and I have dreams of honeymooning in places like the Maldives, Morroco, and Barbados but yes, our own country is also spectacular, don't you agree? To read all the entries, click HERE and HERE. With that being said, we highly recommend for you guys to grab a copy of this book. If you are planning a wedding, a wedding enthusiast, a bride of one of the Power 7, or simply a fan of Filipino creativity, this is definitely worth the buck. This book is not just a great resource for wedding ideas, it also comes with a nifty freebie courtesy of Jason Magbanua himself—an awesome video made just for Thunderbird and as a tribute to the Power 7. I end this feature with a quote from the book: "The term "supplier" does not actually do them justice, as these talented individuals are nothing short of visionaries who tirelessly and passionately craft works of art that intimately touch the lives of their clients" -- and we completely share the same sentiments (did I already mention how Mica and I are such wedding groupies?!?). I personally would like to call them “The Dream Team” or “Wedding PARTNERS”. Our wedding industry and the people that have made it world class deserve a proper tribute—and Thunderbird has done just that. I hope that this would pave way to more versions of this book. There are so many other wedding heavyweights that would be perfect for the next Power 7. Who would you choose to be part of The Power 7 if it were to have a second volume? wow! Looks really interesting Kai! how much is it and where can I get one? :) Thanks! "The term "supplier" does not actually do them justice, as these talented individuals are nothing short of visionaries who tirelessly and passionately craft works of art that intimately touch the lives of their clients" - indeed! Some people just don't know it, lalo na ang mga matatanda. Minsan talagang akala nila taga kuha lang ng picture--di nila alam sikat ang inuutusan nila! Thank you so much for featuring our book and for attending our book launch. This book was made to celebrate the industry, the suppliers, and the people whom they have touched and inspired.